The piano was bought by my grandmother, Annie Rutherford, in the late 1920’s, from the money that she had saved from selling the farm in Quebec. I don’t know whether it was a testament to her belief in the importance of music or her dedication to providing a respectable upbringing for her three children. She herself had learned to play in the convent school in St. Malachi and she probably practiced on the organ that was still in the front parlor of the family farm every summer when we went to visit in the 40’s and 50’s. I don’t ever remember hearing my grandmother play the piano, although the Gulbranson was in our house all the time I was growing up. In fact, until last summer, when I acquired an old photo of my grandmother and read the inscription on the back, I didn’t even remember that my grandmother played the piano. The photo was taken in the early 1900’s and someone had written on the back, “Annie Rutherford who played the piano at our wedding.” My mother, whose memory is fading, does remember that her mother was a reputable player. I do know that my grandmother didn’t sing. For years, from my infancy until I turned 16, I sat next to her every Sunday in the next to the last row in the Rumford Baptist Church and I can testify that she never sang a note. Perhaps she sang when she was younger. But the fact that I never heard her play nor sing doesn’t mean that she wasn’t a lover of music. Perhaps she bought the piano so that the house would have music in it, even though she wasn’t the one who made it. If my grandmother’s love of music led her to purchase the piano at a time when the Depression was having its impact on their lives and my grandfather was a day laborer in the paper mill, I also believe that her vision of the better life she wanted for her children had to have played a part. My grandparents, after all, left their family and sold their own farm to cross the border into Maine so that their children could get a good education and not be stuck on the dairy farm. My grandmother’s determination that my mother would go to college prompted her to send for and even complete the application forms to Farmington Normal School for my mother. I don’t really know the story of how the Rutherford family came to Quebec from Ireland, but I did hear the stories of how they were held in esteem in their small farming village. My great-grandfather, Annie’s father, was one of the few people in that town who could read and, as the stories go anyway, during World War I, the villagers would congregate at the Rutherford home to hear my grandfather read from the newspaper. My great-grandmother was the town mid-wife and embalmer, seeing people in at the beginning of their lives and out at the end. They saw themselves as having a certain responsibility toward the world, and, if my industrious grandmother is any example, felt an obligation to bring some culture and class to what had to be a fairly subsistence-level existence. After all there was the organ. And the piano. So it was probably both the musical appreciation and her notions of the cultured life that prompted her to purchase the Gulbranson from Hansen’s music store down on Congress Street. She took in boarders, taught sewing in night school, and sold corsets in order that my mother could take piano lessons. My grandmother had, before her marriage, been a maid for a wealthy family in Newton, Massachusetts, and all the girls in that family played the piano. My mother would do the same. My first recollection of the piano is one of those memories that I carry around more because of seeing the family photograph than because I really remember the occasion. In the photograph, my toddler self is sitting on the piano bench and turning my head coyly to look into the camera. There are two pieces of sheet music on the piano in front of me: “I’ll Be Loving You” and “Always.” The titles are a message to my father, who, although I am nearly two, has never seen me. He is in the Navy in the South Pacific and the photo was sent to him and returned with him when he came back from the war. My relationship with the piano, though, was not always a happy one. We had our more trying days when my mother decided that I, at seven, was old enough to follow in her footsteps and learn to play. I began taking lessons that lasted for about five years and my most vivid memory of the piano for most of those years is the never-ending battle between my mother and me as to whether I was going to practice or go outside and play. My mother inevitably was the victor and I spent many unhappy hours scowling at the John Thompson music books. I never really held it against the piano, though, for, while I preferred hide and seek with my friends to playing its scales, it provided many happy memories with my mother or father at the keyboard. 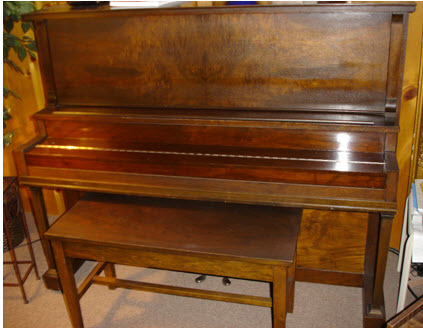 My mother read music and played all the old sheet music that we stored in the piano bench. Whenever the impulse grabbed her, she would sit down and start playing and, inevitably, before long, several members of the family would be gathered behind her, looking over her shoulder at the words and singing along. My father played too, although he had never learned to read music. He had his own style, playing, as we used to say, “by ear” – creating his own chords and bellowing out the melody in his deep, strong, fine voice. We weren’t as apt to gather around and sing when my father played, since his music was a little more unpredictable, but it was joyous and filled the house. In my rebellious teenage years, the piano became a weapon. Whenever my mother and I got into an irresolvable difference of opinion, I would march in, sit down on the wide bench, and literally bang out, usually as loud as I possibly could, Fur Elise or Estrellita – over and over again until my mother begged me to stop. When my daughter was young, and visiting her grandmother, she loved to climb up and play its keys. I never had the heart for enforcing practicing – and could never afford a piano – so she didn’t learn to play, settling for the saxophone and flute instead. My grandson, Galileo, now six, also used to play the keys of the now almost eighty-year old Gulbranson when he visited my mom’s, his great-grandmother’s, condo. Last summer, when Galileo came to visit us at the lake, he found time daily, between Monopoly games, to sit at the relocated piano and learn “Chopsticks” with his fifteen-year old sitter. The Gulbranson has moved five times to four different homes since it joined our family. It moved with us to the house my father built when he came back from the war, back to my grandmother’s house when we moved in with her again, and from the paper mill town to the Maine coast when I was in high school. It moved into the condo with my Mom after my Dad died. It has witnessed all the changes in our family, the comings and goings, the births and the deaths. It is the one piece of furniture that has been part of my life since I was born. I stopped playing the piano after I left home, and except for the occasional five minutes here and there when I was visiting my mom, I never really played that or any other piano for over forty years. Last summer, after I walked around my Mom’s empty condo and dropped off a few treasures to her in the Assisted Living facility, I went back to the lake to situate the piano in its latest home. Then I pulled out her old sheet music and my John Thompson’s and sat down to see whether the Gulbranson and I could still make music together. It is amazing to me how the things that we learn when we are young can stay buried in our minds without ever surfacing for such a long time. I won’t say that I played well enough to recreate any of the annual recitals that the piano and I prepared endlessly for in those early days, but my fingers didn’t forget. Haltingly at first, and then smoothly enough so that my partner sitting down on the dock could at least recognize the song, “I’ll Be Loving You” floated across the lake. Pedagogy based on the use of social media is changing the assumption that the discussion forum is at the heart of online learning. Interaction on a broader scale, supported by social media, the use of hashtags, and the possibility of aggregating related posts has expanded ways that graduate students can relate to others outside their immediate classes and their institutions. Here I suggest three ways the online graduate learner can benefit from social media: to develop a scholarly identity, to publish to a wider audience, and to establish and cultivate a personal learning network. One task of a graduate student is to engage in the practice of being a scholar. Becoming familiar with the jargon of a discipline, its concepts, and its assumptions can be partially accomplished through independent reading and writing and one-on-one professorial dialogue. However, acculturation into a scholarly community goes beyond the cognitive realm. One must learn the tacit knowledge of a field, the practices of a discipline and department (Gerholm, 1990). In Wenger’s (1998) terms, “It is not just the acquisition of memories, habits and skills, but the formation of an identity” (p. 96). Many of the traditional means to develop a scholarly identity are simply not readily available in online programs – proximity to other researchers, the sub-culture of the graduate students, engaging in dialogue in the classroom, seminar or casual settings, with professors during office hours or more informal gatherings, or in campus sponsored scholarly activities. However, some online alternatives now present themselves. Interacting with others engaged in similar research or with well-known writers and scholars in one’s field is possible through their blogs or twitter exchanges, through online discussion forums, webinars, Facebook pages, or in pre-conference dialogue sessions. Through these engagements, students may lurk, study the exchanges, and, when ready, engage. Scaffolding in the form of course, program, or campus exchanges can prepare students for these more public connections. Social media also creates new scholarly norms which must be learned by those who will engage – the appropriate media, the formality or informality of posts, or the acceptable degree of citing and acknowledgment. In what way and how often, for example, does one post on the Facebook page of an admired, well-known writer or of one’s professor? I know students who, in the process of developing their research, posted their dissertation ponderings regularly in their blogs. They got feedback from others who were engaged in similar research pursuits – students and more experienced researchers and writers. They didn’t wait for the final published document – they shared and dialogued as they went along. The learning process is more open in many ways in this new online world, not the least of which is acceptance of transparency in the process of getting there and in engaging with others thinking along the way. Finally, social media affords the evolving scholar-practitioner with a way to build a personal learning network that can be the foundation for later practice and scholarly work. Through engaging and publishing as described above, as well as through other both on and off-line activities, the learner creates what my colleagues (Krisper-Ullyett, Levinson, & Reeves-Lipscomb) and I have described as learning bubbles, nodes of fellow scholars and colleagues, resources, organizations, communities of practice. In one of my nodes, or learning bubbles, are these three colleagues with whom I engage periodically to host events in a larger community of practice of which we are all members. In another, I interact monthly with a group of graduates and about-to-be graduates from across the country who share regarding experiences as post-docs. In a few others, I mostly lurk and read the blog of researchers whose work I admire and with whom I have intermittent contact. These are not new activities, in a certain sense, but social media makes the extent and nature of them different than they would have been to a student a decade ago – more frequent and far-ranging, less hierarchical, allowing me a window into a perspective that I would not then have had access. Siemens, in his seminal article on connectivism defines the personal learning network: “Personal knowledge is comprised of a network, which feeds into organizations and institutions, which in turn feed back into the network, and then continue to provide learning to individual. This cycle of knowledge development (personal to network to organization) allows learners to remain current in their field through the connections they have formed”. He further describes “this amplification of learning, knowledge and understanding through the extension of a personal network” as “the epitome of connectivism”(Siemens, 2004). For the graduate student in a digital world, the evolution of such a network must be a fundamental undertaking, and these networks are the fruits of the engagements and publishing of the student in the world of social media. Gerholm, T. (1990). On tacit knowledge in academia. European Journal of Education, Vol. 25, No. 3, Disciplinary Cultures, 25(3), 263-271. I have been thinking about my involvement in various online communities/networks/social media as, in the next few months, I complete my studies and move from the academic world back into the practical world with a new identity as a scholar-practitioner. Having begun building my identity as a networked scholar-practitioner during the years that I have been a doctoral student, I think now about how I will continue this development and how this identity will change as I leave the haven that has been provided by academia. Nurturing an identity as a networked scholar-practitioner can be understood as engaging in a variety of social and reflective practices. Online presence leaves traces, but these traces can be anything from mere clicks in the big data movement to the creation of a sustained social and active membership in online communities. White and Cornu (2010) have offered a way to understand these varying levels of online engagement. They conceptualize interaction among people on various platforms as taking place in social spaces or places and suggest that people are either visitors to or residents in these places. Visitors see the Internet as a tool, a way to accomplish a task – to find information, for example, or to accomplish a banking function. Their actions do not create a digital identity; once they leave the online world, it is unlikely that others would even be aware that they had been present. They will use email or Skype in the interest of maintaining relationships, but these relationships are seen as existing in the off-line world and the online world is a convenient way to maintain and support those offline relationships. White and Cornu posit that visitors are opposed to developing a digital identity for several reasons – privacy, fear of identity theft, and a sense that ‘engaging in social networking activities are banal and egotistical” (White & Cornu, 2011, § IV, 1). Since I was writing this blog post on Memorial Day Weekend, I decided to investigate these ideas with three women who were sharing the holiday with me. The privacy issue was indeed paramount, as White and Cornu had suggested, but I wanted to inquire further into what lay behind this desire for privacy. A concern that others would take their words and twist them, using them against her professionally, was the concern of one. She didn’t mind if others posted photographs of her, as long as they weren’t ones that could be used against her professionally. A sense of being invaded, of having people know more about her than she liked was the second guest’s explanation. The third participant in this informal investigation explained that she wanted control over what was put out into the world about her – a concern not unrelated to the first two – but also conveyed a worry that extended to photographs as well as text, or even just having other people know where she had been at a particular time. She wanted to be able to mediate how she was portrayed in the world. The third pointed out also that the responses were not unlike what each of the three respondents were like in the off-line world. Although this was clearly a limited sample, my fellow celebrants validated White’s and Cornu’s suppositions. Residents, on the other hand, are those who “see the Web as a place, perhaps like a park or a building in which there are clusters of friends and colleagues whom they can approach and with whom they can share information about their life and work” (White & Cornu, 2011, § IV, 2). Residents, in addition to using the Internet as a tool, are likely to have a digital identity and to have membership in online communities. These are not dichotomies, but a spectrum, argue White & Cornu, with participation and trace-leaving likely dependent on context. Also, they note, these are not an indication of technical know-how or dexterity nor do they place a value judgment on one end of the spectrum being more worthy than the other. Since I have an intermittently active blog, a fairly active Facebook page, and I have recently tried to learn how to use my dormant Twitter account, I fall further along the spectrum from Visitor to Resident than the three participants in my informal survey. I would argue, however, that there does seem to be some kind of tipping point along the spectrum – a decision to adopt a digital identity and support it, even to promote it. Cultivating an online presence in an intentional way requires an awareness of one’s online presence and an attention to its portfolio. Developing that digital identity as a scholar adds still another dimension, for one’s digital identity may precede one’s scholarly identity. Additionally, the decision to own a digital scholarly identity may be a conscious development, or, as Bonnie Stewart wrote in her blog, “Sometimes things shift when you’re not looking … I woke up last Monday morning to discover that practically every Chronicle link on my Twitter feed related to my research area” writes Stewart. Is there not a moment in time when you discover that, decision or not, you have a digital identity as a scholar? Where am I in the spectrum of developing a digital identity? The question is complex in more than one way – in addition to accepting that one will have a digital identity, there is the question that emerges from a realization like Stewart’s, to what extent is one’s digital identity that of the scholar? Or, in my own case, of a scholar-practitioner? More of that on another day. Posted in Uncategorized | Tags: social learning"
So one when Dave Cormier suggests that I think about rhizomatic learning in opposition to the “hierarchical, linear image of the tree” (Cormier, 2014), I want to put it in the context of it is one way of learning, but that hierarchical, tree-like learning is not evil. In Western society, we have relied on it probably too heavily, but it is not all that is bad in the world. I love patterns; I love finding patterns when I am learning. It is an important part of the connections that I make in learning. The “decentralized, unpredictable” rhizomatic learning is the part of learning where I explore and uncover. It is the divergent part of learning. But I also value the part of learning where – after being surprised by what I have uncovered, I connect it to other things I have been thinking about and sort it into some kind of schema. Or where I discuss with my fellow learners and tweak or even upset my thinking about the discovery and come to some agreement about it. That is the convergent part of learning. I want to be clear also, that I don’t believe that dichotomizing is always the wrong way to approach things. Understanding concepts in relation to other concepts is an important part of how we understand the world. We create “ideal types” so that we can characterize what we see and compare it to other ideas that are in some proximity. I only want to avoid the dichotomizing to the extent that I remember that in the world, things are messy and don’t fit into one of the other of those types. I don’t want to demonize dichotomizing! Secondly, Dave has suggested that we use the concept of cheating as a way to uncover and “take apart the structures that [we] work in.” In reading over several of the posts from others in this course, I was happy to find comments from Jenny Mackness and by Chadi Aljundi on the differentiating cheating from collaboration or plagiarism from citing. To me, these are important distinctions. Dave’s question did make me stop and appreciate, though, how much my own thoughts are a result of reading a blog or a conversation with a colleague. The line is often blurry between repurposing and restating. And how often I use the phrase, “Can I borrow that example?” of “To borrow an idea from a noted scholar”. I think I use borrow as a word with fewer negative connotations than steal. I think the point Dave was getting at, though, is that knowledge is not an object that one can appropriate. Learning is about connecting, separating, agreeing, disagreeing, and sorting and settling – for the moment at least. I think I cheat when I don’t do something with the ideas of others, when I make them my own without dwelling with them for awhile and putting my own sense-making into the mix. But that is about cheating myself as much as cheating anyone else. I mean, it’s not the best way to get across that you didn’t like what I wrote. To be able to reply to you it would be best if you stayed on content. But if all you can muster is a personal attack on me then that’s fine- I just can’t develop a conversation from that. When I speak about these issues they sometimes can feel personal to some readers. I get that; I understand. However, know that more often than not I’m talking about structural problems or systemic issues. If your concern is about my “expertise” and you do not think I should be speaking on this topic. Well, again- I can’t help you there. I see a lot of comments on blogs in general from people who are trying to disqualify the writer by pointing out potentially meaningless facts about their lifestyle choices. This is kind of weak. I think that no matter who you are, you can insert yourself in any conversation and dare to be political. That’s all it is, daring to be a little more engaged with an issue and a little more political. There should be space for that. One of the most important thinkers I know has no personal identification with Palestine, yet he became a really important voice and ally on Palestinian issues. I think that’s really cool of him. Anyhow, I take any comments- pretty much unmoderated too (’cause I’m lazy like that)- but this blog is intended to spark a conversation about a perspective that might not be offered on mainstream media- and, well, a conversation cannot begin through personal attacks. Thanks for trying to engage though! It’s good to know people are passionate about things even if their opinion may differ. “What do you think?” my daughter asks me from Nairobi, near where the attack on the mall has killed over 60 people and injured over 100. She is asking me if she is wrong to continue on her journey to mobilize people in the interest of sustainable agriculture and making the world a better place. She isn’t really thinking about coming home. She is asking me how I am handling this as someone who loves her. I want to say, “Of course come home. Come home and stay in my house and let me take care of you and never leave.” But I don’t really want that. The world is an unsafe place. I ask her how it is there and she reminds me what it was like when we came home to New York City on 9/11. She reminds me that things like this happen in Washington, D. C. last week and in so many other cities in our own country. She tells me she wishes she had someone there to share all this with her. She has met and liked so many people in this far away place, and they have been kind to her, but she travels through it all on her own. I don’t really want to tell her to come home. I want to tell her how brave and strong I think she is and how proud I am of her. She tells me her hope that if she can help people to farm better, help them to have better lives, then maybe there won’t be so much need for this kind of violence. We can’t keep our children safe, I think, but we can hope that they will live in the unsafe world and do their best to make it safer and savor the moments in between. That is a better answer than coming home and running from the world. Travel well, dear heart, and enjoy the elephants on your safari on your time off this weekend. Why do I write daily? This: “Writing daily forces you to come up with new ideas regularly, and so that forces you to solve the very important problem of where to get ideas. What’ s the answer to that problem? Ideas are everywhere! In the people you talk to, in your life experiments, in things you read online, in new ventures and magazines and films and music and novels. But when you write regularly, your eyes are open to these ideas.” Yes, there are some other reasons that involve audiences and persuasion, but for me this is the big one. To me, writing is like breathing. The only way to breathe in, is to breathe out. I am inspired by just having finished Alison Bechdel’s Are You My Mother? I love the genre of the graphic novel. Bechdel tracks so many layers of consciousness at the same time! Her dreams are on black pages. Her conversation with her mother on the phone (often in the background – or is it foreground) progresses at the same time as her thinking about Winnicott (psychoanalyst) or Virginia Woolf – or both and then bleeds into some childhood memory or a session with her own therapist! I wish I could draw – I would love to write this way. My compromise is to renew my acquaintance with my blog. As Babauta says, above, writing is how I open myself to the ideas rotating in my mind. I write for myself, offline; I write my dissertation; but this could be a more open space, to get down the rotations – like Proprioceptive Writing. This helps to put my research into context, which is always helpful to me. My research, therefore, is targeted at Theories and Methodologies in the first column, the preparation stage of the Teaching Lifecycle, and the module level of granularity. The core concepts inform my work, but are not directly addressed. Additionally, the report identifies two important concepts for my own thinking. The first is the notion that a learning design may or may not be independent of practice, that it might be a description of an abstract set of activities that could be instantiated in many contexts or it might be developed for a specific set of learners – which then could possibly be shared more widely. In other words, a learning design may be developed deductively or inductively. Could this be a factor for those I am interviewing? Probably depends on whom I interview. Since I envision that they will be primarily educators who do both the design and the implementation, the inductive or deductive nature could perhaps be an issue. Hmmm, perhaps I should check my interview protocol and add a specific question about how they arrived at the design they are describing. Secondly, Dalziel and his colleagues validate the impossibility of “pedagogical neutrality”. While this may not be particularly relevant for my research at the moment, it is reassuring to have them acknowledge the bias of learning designs, at any level of abstraction.